British/Scotch beef meatballs with garlic and herbs. Succulent juicy meatballs, with basil, oregano and thyme for a wonderful taste of Italy. Gluten free. 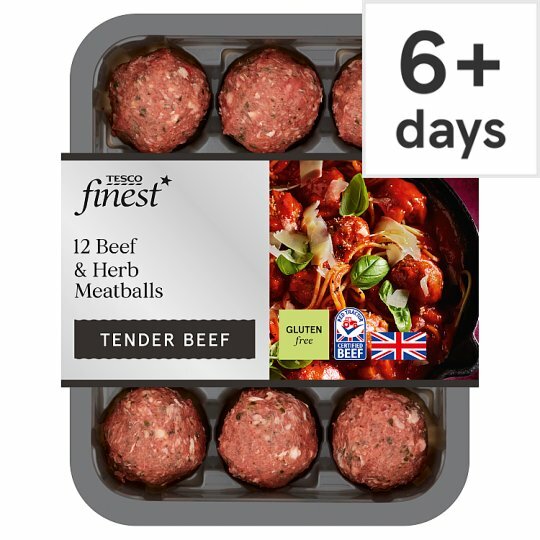 British Beef (86%), Water, Basil, Pea Flour, Rice Flour, Sea Salt, Garlic Powder, Black Pepper, Preservative (Sodium Metabisulphite), Parsley, Oregano, Bay, Thyme. Scotch Beef (86%), Water, Basil, Pea Flour, Rice Flour, Sea Salt, Garlic Powder, Black Pepper, Preservative (Sodium Metabisulphite), Parsley, Oregano, Bay, Thyme. Keep refrigerated., Once opened, use immediately. Instructions: 160°C/ Fan 140°C/ Gas 4 Remove all packaging. Place on a baking tray, evenly spaced, in the centre of a pre-heated oven, turning once half way through cooking time. Defrost thoroughly for a minimum of 12 hours in the refrigeratorOnce defrosted, do not refreeze.Follow the preparation guidelines above. Packaged in a protective atmosphere.Caution: Although every care has been taken to remove bones, some may remain.Caution: This product contains raw meat.